﻿Over the course of this two-day workshop, we’ll explore the modern technical models for mobility and stability for performance. 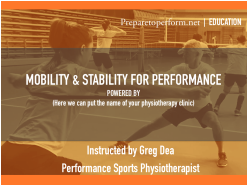 From both a theoretical and practical perspective, the goal is to provide you with an understanding of how to use mobility and stability to stay in the game longer, allowing greater training capacity. Does not include accommodation. All payments will be shown in New Taiwan Dollars, but accepted in, and based in Australian Dollars. The organiser is not responsible for price fluctuation based on currency exchange rates or fees on date of registration. 09:15 Practical: Evaluations and interventions for fundamental trunk movements involving upper and lower quarters. 13:30 Practical: Evaluations and interventions for fundamental upper quarter mobility and stability (shoulders to trunk). 08:30 Practical: Evaluations and interventions for fundamental lower quarter mobility and stability (hips to trunk). 13:30 Practical: Combination trunk, upper and lower quarters in transitional and higher positions, with patterned power.